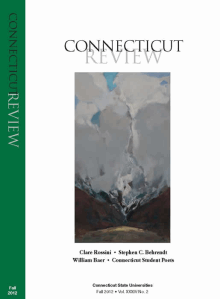 Connecticut Review is published twice each year by the Connecticut State University System as a public service contribution to the national literary and intellectual discourse. Each issue of the journal is 200-212 pages in perfect bound 6 x 9 format and contains poetry, fiction, short essays, scholarly articles and fine artwork. The journal publishes the best in contemporary literature and essays. The selection process focuses on bringing to general readers cutting edge work that is both thought provoking and accessible. Connecticut Review is under the exclusive direction of editors chosen from each of the four CSUS universities: Western Connecticut State University in Danbury, Central Connecticut State University in New Britain, Southern Connecticut State University in New Haven and Eastern Connecticut State University in Willimantic, Connecticut. IInterview Interview Up to 4,000 words. RArticle Article Up to 4,000 words.